Hello from Washington D.C., the site of the 231st Meeting of the American Astronomical Society, which officially kicked off Monday evening. The AAS’s winter meeting is typically very well attended, so there are plenty of people to talk to and things to see. Plus, some pretty exciting announcements about new discoveries and upcoming projects. Monday afternoon, I had the chance to speak with Patrick McCarthy, director of the GMTO organization responsible for the Giant Magellan Telescope (GMT). The GMT will combine seven 8.4-meter (27 feet) mirrors to create a single-aperture telescope with the equivalent of a 24.5-meter (82 feet) diameter. The telescope’s fifth mirror was recently cast, and we discussed the unique challenges involved in creating — and transporting — its mirrors. While the central mirror is shaped and curved like a “traditional” large telescope mirror, the outer mirrors will be curved more like “potato chips,” a never-before-attempted design that required rigorous testing to prove it would be successful before the project could be undertaken in earnest. When completed, the GMT will offer images up to 10 times the angular resolution of Hubble, and provide the perfect stepping stone to further humanity’s quest to understand the cosmos. I’ll be sharing a more in-depth look at this amazing project in the days to come, so stay tuned! Tuesday marked the first full day of the conference, with two formal press conferences on various astronomical results and a science writers’ seminar on the upcoming Transiting Exoplanet Survey Satellite (TESS). In the morning, we heard about “astronomy from the stratosphere” from researchers using NASA’s Stratospheric Observatory for Infrared Astronomy (SOFIA) airborne observatory to unravel the mysteries of magnetic fields and their role in processes on large and small scales, as well as investigate the way in which interstellar clouds of gas cool and collapse to become stars. 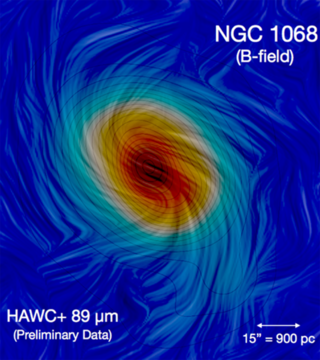 Enrique Lopez Rodriguez of the SOFIA science center showed stunning results of using SOFIA’s HAWC+ instrument to map out magnetic fields on galaxy-sized scales. HAWC+ is capable of measuring polarization, which can in turn tell astronomers when magnetic fields have caused grains of dust in a region to align. Understanding the magnetic fields that permeate galaxies and how they interact with matter inside and outside the galaxy is key to understanding these fundamental units of our universe. Fabio Santos of Northwestern University showed HAWC+ results on a smaller scale, delving into the Milky Way’s Rho Ophiuchi A star-forming region to demonstrate that the density of the cloud appears to play a role in the polarization of its dust grains — a result predicted by the radiative alignment torque (RAT) theory, the subject of the next talk presented by B-G Andersson of SOFIA and Universities Space Research Association. RAT theory states that while silicate (sand-like) grains of interstellar dust align according to magnetic fields, carbon (soot-like) grains align due to strong radiation (light). Testing RAT theory with the unique capabilities of SOFIA will help astronomers pin down the role of magnetic fields on both large and small scales. Finally, Elizabeth Tarantino shared her work on ionized carbon (C+) emission in spiral galaxies, and how understanding this emission — which is a primary mechanism of cooling for the gas in these galaxies — influences star formation. If that sounds pretty technical, here’s a simpler explanation: in order to form stars, hot gas must first cool and condense into cores that collapse under their own gravity, ultimately reaching high enough densities and temperatures to ignite fusion. C+ emission helps to cool the gas as carbon ions radate away heat, so this process is essential to understanding star formation. Using SOFIA, Tarantino’s work is uncovering which types of gas in spiral galaxies is cooling via this emission, then tying it to the galaxy’s current and potential for star formation. After lunch the conference’s press attendees reconvened for a seminar on TESS, NASA’s next exoplanet-finding mission, currently set to launch this year. We heard presentations by George Ricker, Sara Seager, Padi Boyd, and Elisa Quintana on the mission’s progress, goals, and the many ways in which it will help to revolutionize the fast-growing field of exoplanet studies. This satellite, though only about as tall as a human, will help us find hundreds of Earth- and sub-Neptune-sized planets around bright nearby stars, filling out the local solar neighborhood with planetary systems. TESS is a discovery mission, meaning it will find these planets but not study them — that’s the job of the upcoming James Webb Space Telescope (JWST), set to launch next year. JWST was also the next subject on my to-do list today, as I sat down with Scott Willoughby and Alberto Conti on the current state of this next-generation infrared telescope. More than a decade in the making, I heard about some of the utterly astounding innovations it’s taken to make Webb possible, as well as the many ways in which it will open up better paths to answer many of astronomy’s major questions. Now that its separate instrument and structural components have passed major testing milestones, it will soon be time to combine them together for final testing. The clock is ticking down to the telescope’s launch date, and what I heard today makes me more excited than ever about the day it begins science operations — something I’ll also be sure to share with you in the days to come. The final press conference of the day addressed a variety of science topics, from Cepheid variables to the environments in which planets form and star formation is stopped. Katherine Hartman of Pomona College spoke about a new way to use APOGEE survey data to improve Leavitt’s Law connecting the period and luminosity of Cepheid variable stars, a key distance indicator. Robert Wilson of West Virgina University presented work finding that small changes in the amount of iron present in a star during formation can have profound impacts on the types of planets found around it, possibly providing researchers with a way to unlock the mystery of planet formation and at least some of the processes that govern it. 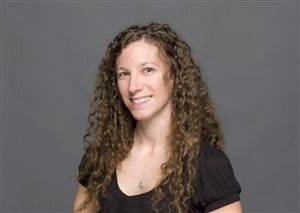 Catherine Grier of Pennsylvania State University spoke about the results of a new survey to measure a large number of supermassive black hole masses at once via a technique called reverberation mapping, using the BOSS spectrograph on the Sloan Digital Sky Survey. By observing multiple objects at once, her team has increased the number of supermassive black holes with mass measurements using this time-intensive method by two-thirds, adding 44 new objects to astronomers’ database, including many objects at larger distances than ever measured before with this method. Karen Masters of Haverford College and the University of Portsmouth then spoke about work using the SDSS MaNGA survey to study a sample of dwarf galaxies — the universe’s most common star-forming machines — that had inexplicably stopped forming stars. She and her colleagues found signs that an active supermassive black hole inside these galaxies was responsible for stopping, or quenching, the star formation; while such activity is accepted as a factor in much larger galaxies, supermassive black hole activity was never before thought to play a role in dwarf galaxies in this way. I concluded my evening with a brief trip to the exhibit hall to view the evening iPoster session — more on that in an upcoming blog — and stopped by the National Radio Astronomy Observatory’s press reception, where I caught up with some ACEAP colleages and a few former Astronomy associate editors! It’s been a busy start to the AAS winter meeting, but I’m already excited to share what I’ve learned in greater detail as time permits. Until then, hang tight for more meeting notes and quick insights into the most recent astronomical discoveries!